In this painting only the lower portion of Kelly’s body is revealed as attention is focused on the bushranger’s rifle, which frequently appears in this series, distinguished by its yellow colour. Here, Kelly is proudly showings off his weapon, which is presented like a museum artefact, horizontal and close-up, the rifle’s peculiarly reversed trigger becomes the focal point. 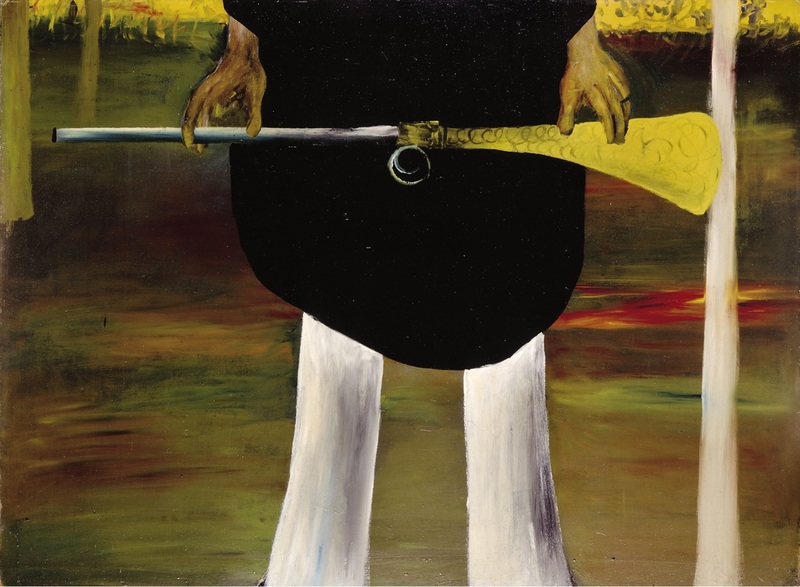 The rifle can be interpreted as a symbol of power and authority and the slashes of red and yellow paint as well as Kelly’s confrontational stand, accentuate the bushranger’s strength and his close relationship with the land. Yet there is something incongruous in the delicate way in which Kelly holds the rifle, almost as if it is being offered up in surrender.